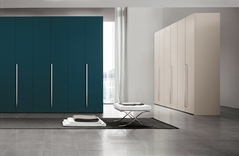 Available in many colours, buy beautiful Contemporary Wardrobes and Walk-In wardrobes with a fabulous selection of internal fittings to custom fit your bedroom or dressing room. Contact us now for ideas. 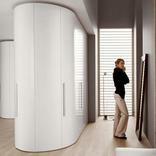 At Robinsons Beds we have a top quality designer wardrobe to suit every bedroom design. 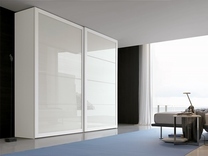 Our modern wardrobe ranges include free standing made to measure custom wardrobes, mirrored sliding door wardrobes, corner wardrobes, unusual and stylish hinged doors wardrobes, room divider units and dressing room modules to fit the available space and shape of your bedroom and many come in a wide selection of colours and matt and gloss lacquer finishes. 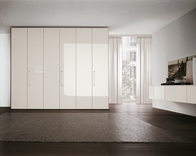 Whether you are looking to invest in a contemporary wardrobe for a sleek, clean and modern looking bedroom or a traditional wooden wardrobe for a more classic look our brilliant designer ranges come from highly regarded Italian manufacturers such as Presotto, Tomasella and Novamobili. 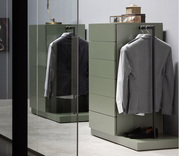 Most bespoke wardrobes come with options of the best and most useful internal fittings including drop down rails, tie trays, shoe rails, belt racks, adjustable shelving, drawers, trouser rails, hidden valuables cupboards, interior mirrors, TVs and lighting allowing you to personalise the wardrobes and dressing room units to fit your needs. 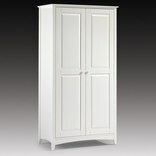 We have many more options than we have priced online so if you don't see what you are looking for please contact us to discuss other possibilities as we have many years of experience fitting out bedrooms, closets and dressing rooms for luxury homes and hotels and working with interior designers and clients' architects to deliver their vision. 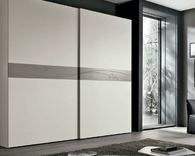 If you're looking for something unique take a look at the Presotto Dama wardrobe which comes with an inbuilt TV for a fantastic touch of luxury for those long, lazy mornings in bed or the Presotto Shape wardrobe with its multi-coloured panelled doors in a multitude of colour choices for individuality.